Two-term Rhode Island State Representative Aaron Regunberg is still in his 20s, but already has a long pedigree of organizing for social change. At 20, Regunberg co-founded the Providence Student Union, a group dedicated to empowering high-school students to “win a fair say in the education system.” At 24, Regunberg was elected to the Rhode Island State House after running on a strong progressive platform. At 26, he helped organize Bernie Sanders’ come-from-behind victory in the state’s Democratic primary. At 27, he sponsored a successful effort to pass paid sick leave legislation. Now, at 28, he’s running for lieutenant governor, backed by organized labor and the Ocean State’s growing activist community. Regunberg, a Brown University graduate, is challenging one-term incumbent Dan McKee in the September Democratic primary. McKee is widely considered a conservative-leaning Democrat and has close ties to the state’s charter school lobby. Unlike in other states, lieutenant governor candidates in Rhode Island do not campaign as running mates but rather are popularly elected every four years. 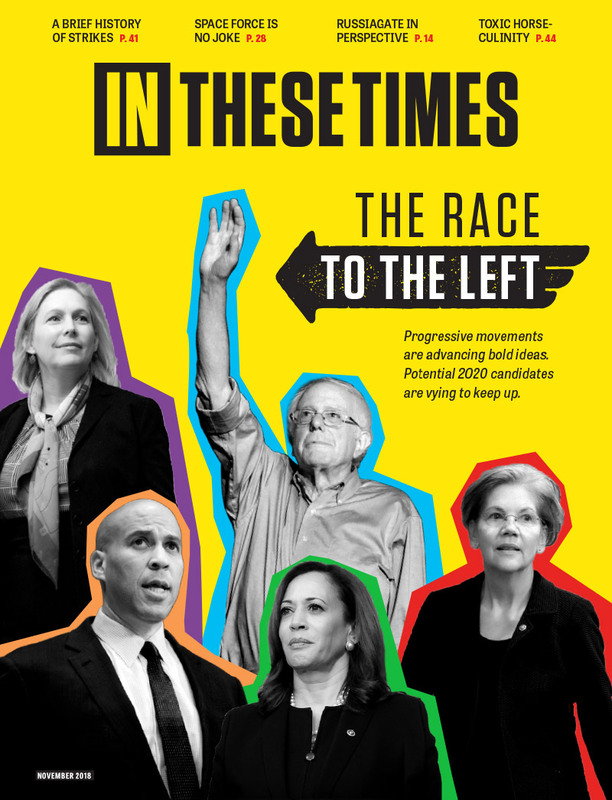 The race fits into a broader nationwide pattern of progressive candidates challenging moderate and conservative Democrats in party primaries, with many of these challengers inspired by Bernie Sanders’ historic 2016 presidential campaign. Regunberg’s campaign has won the support of organized labor, and is being powered both by the growing anti-Trump resistance movements as well as Rhode Island’s progressive statewide infrastructure. What would this 28-year-old self-described progressive do once in office? His platform calls for creating a state-based Medicare-for-all system in Rhode Island, passing a $15 minimum wage, defending public education, codifying Roe v. Wade abortion protections on the state level, and protecting the environment through instituting carbon pricing. While the position of lieutenant governor is in large part ceremonial, the office does offer a bully pulpit, a substantial staff and policymaking authority on issues ranging from long-term care to homelessness. “I want to really turn the lieutenant governor’s office into an organizing base to bring folks together and build coalitions to get more ambitious progressive policy changes,” Regunberg says. Regunberg has the backing of a number of powerful labor organizations in the state including the Service Employees International Union (SEIU) 1199, the Amalgamated Transit Union (ATU) Local 618 and the International Brotherhood of Electrical Workers (IBEW) Local 2323. He is also being supported by the Rhode Island Working Families Party, which, in 2016, led a successful effort to defeat four conservative Democratic incumbents in the state legislature and replace them with progressives. McKee, meanwhile, has failed to receive high-profile union endorsements. Some attribute this lack of labor support to McKee’s longtime backing of charter schools, which the state’s teacher unions strongly oppose. In 2014, pro-charter school interests helped fund McKee’s campaign. Labor’s willingness to back Regunberg could point to a larger shift in the state’s politics, as unions are generally reticent to endorse primary challengers. And as public-sector unions face a future of scaled-back funding as a result of the Supreme Court’s Janus v. AFSCME case, Regunberg’s campaign shows a potential way forward. While unions may soon have less financial capacity to hire lobbyists and play the legislative inside game, they can use members’ boots on the ground to help elect pro-labor challengers in Democratic primaries, rather than spending money on influencing Democrats who are hostile to unions after they are in office. For Emmanuel Falck, the head of SEIU’s healthcare division in Rhode Island, Regunberg embodies the type of pro-labor Democrat that unions need to rally behind. When it comes to his relative youth, as a 28-year-old running for Rhode Island’s second-highest office, Regunberg admits that millennials “get a lot of hate.” But that doesn’t phase him. “We’re leading all of the fights that matter right now,” he says. “We’re the generation that graduated into this terrible economy that we didn’t create, a student loan crisis that we didn’t create, an ecological crisis we didn’t create, and with all of that, we’re stepping up to the challenge, whether it’s the climate movement or Black Lives Matter. So, how do we get in touch with this guy? Or how do we get in touch with his campaign?